Stunning theatre show for hire. In the early 1990s singer Barb Jungr met producer and musician Kuljit Bhamra. Together they formed a trio and released a CD, Durga Rising, a pot pourri of all of their respective influences and interests, which is also now available as a show. 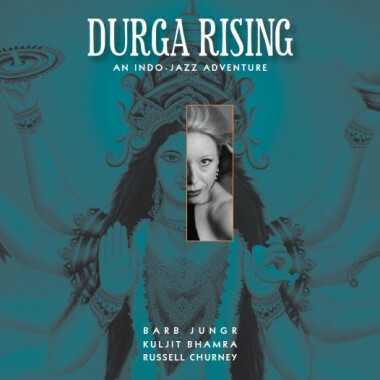 Groundbreaking 90s fusion album Durga Rising was re-mastered and re-launched in May 2011, with the inclusion of three extra previously unreleased tracks! It is also available as a show; suitable for venues and festivals, it is currently touring throughout the UK and internationally under the auspices of Matters Musical. In the early 1990s singer Barb Jungr met producer and musician Kuljit Bhamra. Barb was, at the time, working with pianist Russell Churney with whom she had appeared for many years alongside comedian Julian Clary. Together they formed a trio and released a CD, Durga Rising, a pot pourri of all of their respective influences and interests, with several original numbers. For some years, the recording was considered a cult CD and ahead of its time. In 2009 Kuljit – by this time hugely respected as a leading musician and authority on Indian and British Asian Music – suggested a re-release of the album. Kuljit proposed to Barb – now a highly regarded song stylist – that a it should include some previously unreleased original material that the trio had recorded in the 1990s. Sadly Russell Churney died in 2007, but both Kuljit and Barb felt keen to play the material again, anew, and they approached Simon Wallace, the stunning jazz pianist and composer. A collaborator of Jungr’s, Simon was thrilled to be involved with the re-emergence of Durga Rising. With rave reviews internationally and two New York awards (2008 Nightlife Award for Outstanding Cabaret Vocalist and Best International Artist 2003 Backstage Award), Barb Jungr is renowned for her unique vocal style, approach to arrangements and interpretation of song. Her acclaimed record releases and live performances have brought her to the world stage and revealed her to be one of Europe’s most exciting voices. Critics have compared her to Nina Simone and Peggy Lee, called her “a British Edith Piaf”, “one of the best interpreters of Jacques Brel and Bob Dylan anywhere on this angst ridden planet today” (Village Voice, New York) and “mesmerizing” (The New York Times). Somehow she manages to find the time to write too, and her show The Fabulous Flutterbys opened at The little Angel Puppet Theatre in May 2010 to universal acclaim. See some songs and scenes here. A virtuosic tabla player and highly skilled improviser, Kuljit Bhamra is one of the most inspiring and influential musicians, composers and record producers on the British Asian music scene. A pioneer of the worldwide Bhangra phenomenon, he combined traditional Indian rhythms with western instruments and multitrack recording techniques, thus transforming Punjabi music into a new dancefloor sound. He has composed and produced over 2000 songs and is responsible for the rise to fame of numerous Bhangra and Bollywood stars. He has scored music for films such as the award winning Bhaji on the Beach, Bend it like Beckham, Indiana Jones & The Temple Of Doom and Charlie & The Chocolate Factory and worked on theatre shows including Bombay Dreams (arrangements and on-stage percussionist) and The Far Pavilions (for which he was the first British Indian to compose for a West End musical). For 30 years Simon Wallace has had a varied international career as a composer, pianist and musical director. Since the early 1990s he has written songs with the great American lyricist Fran Landesman which have been performed and recorded by singers on both sides of the Atlantic. With co-composer Simon Brint he has written music for some of Britain’s most popular TV shows including ‘Absolutely Fabulous’ and ‘French and Saunders’. His concert works include two symphonies commissioned by the Bangkok Symphony Orchestra for Thai state occasions. In 2010 he toured in Britain and America with singer Barb Jungr and in Ireland, Norway and Portugal with the Waterboys. Writing and recording projects in 2010 included music for Armstrong and Miller’s BBC TV shows and for their 60 date UK tour. Throughout 2009 and 2010 he made regular appearances leading a trio at Ronnie Scotts Club in London. 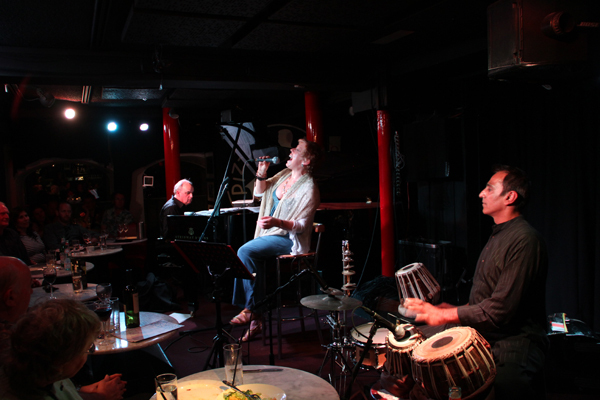 “Back in 1996, vocalist Barb Jungr had toured the world with the British Council but not yet released her first solo album; Kuljit Bhamra was a successful percussionist and Bhangra producer but had not yet worked on the soundtrack to Bend It Like Beckham or recorded with saxophonist Andy Sheppard; and pianist Russell Churney (who died tragically young, of cancer, in 2007) was a renowned musical director and composer. In that year, the three recorded Durga Rising. Although previously available via mail order, this expanded version is released properly for the first time. Subtitled “an Indo-Jazz Adventure”, it seamlessly combines Indian percussion with jazz vocals into an amalgam that sounds like a natural combination. Credit goes to Bhamra whose choice of rhythms and percussion gives an Indian flavour to the music without unduly altering it. Eleven of the album’s 15 songs are originals by members of the trio, the remaining four being cover versions. As on Jungr’s solo albums, those covers come from a surprising range of sources, yet her interpretations reinvent them, making them her own. In typical fashion, she conveys the nuances of every line, singing them all as if she has lived each experience and emotion. Jungr devotees will be delighted – but not surprised – that the album’s outstanding track is a version of Dylan’s Blind Willie McTell, her first recording of one of his songs. Lasting nine minutes, it begins gently but steadily intensifies before a fine cello solo from Stan Adler and Jungr’s wailing harmonica solo lead to an impassioned climax. Just as impressive are the sensuous version of John Martyn’s Go Down Easy and the cello-driven reworking of The Cutter by Echo & The Bunnymen. Vital to the album’s success, the originals manage to hold their own in such exalted company. They cover a broad spectrum from the catchy pop-inflected Watch Me as I Fall, by Bhamra-Jungr, to the more emotionally harrowing Choose to be Alone by Churney-Jungr and the powerful Green message of Crimes Against Nature by Jungr and guest guitarist James Tomalin.